Each of the 100 glowing tongues of Voices carries a unique colloquial term. Photo by Kai Stanecki. This fall, regular visitors to Madison’s Olbrich Botanical Gardens may find themselves in an unfamiliar place. As the sky trades sun for moon, strange shapes glow among the sixteen acres of carefully tended landscapes. On the path near the entrance, a massive and luminous dragonfly pulses with alternating hues: blue and green, red and gold. A light sculpture made from glass and metal, Alighting was created by Madison artists Laura Richards and Grant Turnbull and lighting designer Patrick Devereux to illustrate the luminous beauty of native dragonflies. Alighting is part of a collaborative sculpture installation at Olbrich Botanical Gardens called GLEAM, Art in a New Light that explores the intersection of light, sculpture, and nature. Milwaukee artists Dianne Soffa and Tom Kovacich collected almost two hundred rearview mirrors and perched them on stakes along Olbrich’s Prairie Dropseed Meadow for Rearview Stream. Blue Mounds-based lighting designer Craig Kittleson worked with Soffa and Kovacich to create a ripple effect of light through the mirrors, not unlike moonlight reflecting upon a stream. 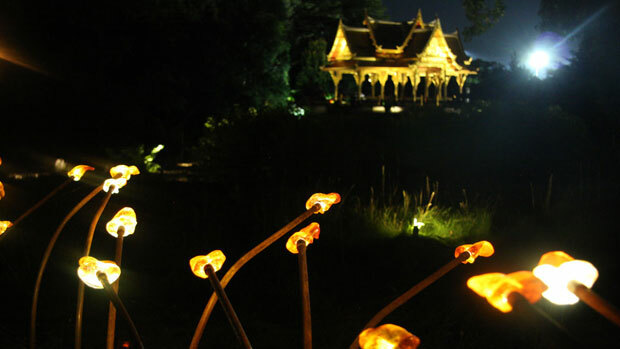 Through GLEAM, sculptural artists and lighting designers benefit both from their exchange of expertise as well as the opportunity to work in a unique venue. Olbrich, in turn, finds a creative partner to complement the natural beauty of the space. While the illuminated sculptures offer various points of interest throughout the garden, the entire exhibition literally sheds light on a landmark Madison attraction, creating a fresh visual experience for new and returning visitors alike. When pink lights bounce off familiar trees and blue dots stack against visiting bodies as if they intend to stay, the landscape becomes surreal, evoking the feeling of discovering something new and exciting in a once-familiar place.